While Dad was away on his last trip I stayed with Damien and Nicolas and the mob in Hermannsburg. I know them all now. There is Clarabel, Emmo, Jenise, Qintin and lots of others. I sleep on Jenise or Quintin's bed. When someone says 'get on your bed Tommie' I jump on their beds. That cracks everyone up. I sleep outside mostly at night and bark at anyone who comes near the house like I own it. The Hermannsburg dogs are really skinny. Because I am pretty big because of my muscular frame they are a bit scared of me. They roll over a lot except for when they are in a pack. Then I roll over. It's the way of things. I wish Dad would roll over sometimes. It feels good. You can just let it all go. "Ooh you are so much more powerful than me... ooh .. I wouldn't dare get on my feet when you are around ... you are sooo strong"
Then the dog gets all puffed up and proud. An hour later they get beaten up in a fight. Just roll over and show your tummy I reckon. It saves so much aggravation. I was at Damien's for 4 days and he wouldn't let anyone feed me extra food. He gave me only one meal a day in the morning. I got really fat staying there last year and couldn't jump in the car. It's funny having cross-cultural links with Aboriginal people. I also stay with so many different people and meet dogs from lots of different walks of life. In Sydney it's the Schnauzers, Shih Tzu's and the labradoodles. I don't do too much rolling over there I can assure you. I met 2 dingos in Uluru last week. They were my cousins. Their master was saying that they are no different to other dogs. 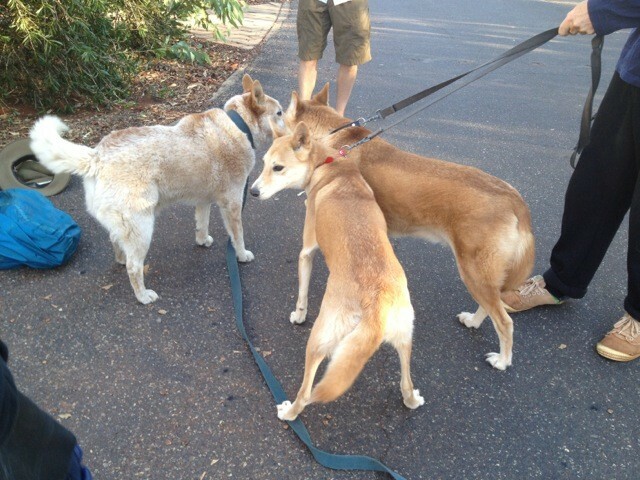 Anyway it was good to have a good dingo sniff. You know I am part dingo don't you. Alpine dingo with thick hair for the cold. Have a look at the photo and you can see why. Anyway. Dad and I are off to Adelaide to pick up the Adventure Camper tomorrow. A new life is on its way. 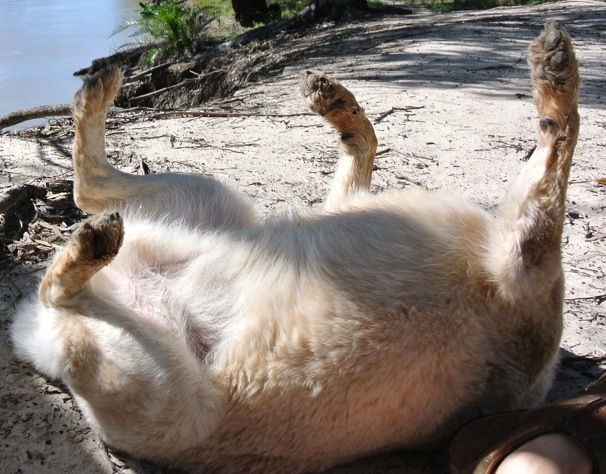 He talks about a dingo this week in his eSwagBlog which should really be my job. You crack me up Tommy. Glad your dad has you to look after him on all your travels. Yap yap yap yap! My best friend is a dingo, but I'm not allowed to tell anyone. It's a secret, cause he lives in suburbia and apparently dingoes are not allowed. That's prejudice, that is! He is beaut fun. We run around a lot when Mum visits her sister. You are very busy and your new camper sounds like great fun though I'm still enjoying being back home. I love the beach and ocean.